Disaster relief efforts and strikes are often short staffed, therefore the need for nurses provides a great opportunity to help those in dire need and make some good money. In many cases, these situations work out better because they are not stuck in a typical 13-week timeframe. The downfall is you may have to start packing your bags the moment you get the call. In some cases, agencies will offer signing or referral bonuses for traveling nurses, but while the extra dollar signs may seem appealing these bonuses are there to compensate for low regular pay. The key is to look for the positions that offer higher base pay (some assignments will pay up to $65/hr). If you are an animal lover, pick up dog walking by registering on apps like Wag! and Rover. You can combine two of your favorite things in your off time: dogs and nature! If you become a travel nurse so you could explore nature and you love to journal your experiences, you can start a blog or podcast! These outlets often lead to some sort of inflow of cash because companies will want you to advertise their products if you generate a big enough following. Photography is a great way to bring in some money. If you travel to places for the scenery, you may want to grab a camera for the next time you get assigned. To make more money, you have to limit your costs as well! A way you can minimize your costs is to find a housing stipend. This will help you pick your own housing pick how much you will pay at that place. Another way to cut down on your costs is to stay organized. Keep a record of what you have spent on past assignments to negotiate your price when you re ceive the stipend. Putting the money you receive from bonuses into savings helps to handle your unexpected costs in the future as well so you don’t go in the hole. There are also simple ways to save a buck as well! One such way is to take care of yourself. Staying healthy will help you avoid additional medical bills and missing some hours at work. Use these self-care tips to keep a healthy mind and body! Plus, you feel better when your mind and body are healthy – it’s a win-win. Looking for bargains and deals when you are shopping and cooking meals at home. Create an excel spreadsheet for easy bookkeeping of your finances. Keeping a sharp eye out for coupons is another way to cut back on costs on the road. Acting on these ideas will surely make your wallet feel a little heavier after your assignment! 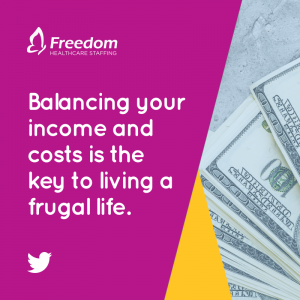 Balancing your income and costs is the key to living a frugal life. Keeping an eagle-like eye on your wallet is one way to optimize your wallet. If you are looking to maximize your money and minimize your costs, utilize the tips above and you should be in great shape! Check into our traveling nurse jobs portal for the latest assignments in your specialty!